When addressing large groups of people, language, for the speaker, can prove trickier than most people think. This is something that many presidential candidates past and present will agree to. Though mistakes have definitely been made in English more than enough times (largely by George W. Bush), what has often tripped up candidates is trying to address Hispanic voters. Jeb Bush, brother of George W. and Republican party front-runner, did his first Spanish language TV interview at the end of July. British translation company London Translations state on their spanish translation page that ‘Spanish skills can provide a competitive advantage to almost any company planning to do business outside of the anglosphere’. This is also very true of US politics, and luckily for Jeb, he is fluent in Spanish. Other candidates have not been quite so lucky, and through lack of foresight or use of an apt and savvy translation team, have fallen short of the mark with Hispanic voters. Attention to detail is incredibly important for all translation, from business to literature to politics. Even a small error on behalf of a candidate can leave a sour taste for prospective voters. in 2008 Hillary Clinton used the phrase “Si, se pueda”, meaning ‘yes, we can’ however what she meant to say was “si, se peude”. It seems like a very marginal error but when you take the phrase in context it is still a little embarrassing. “Si, se puede” is one of the most famous political phrases in Spanish in the US. It was used by Cesar Chavez during his 24 day fast and has connections with unions, civil rights movements and fights for US immigration policy changes. Clinton’s error risked alienating her Hispanic audience and showing a lack of sensitivity to the issues many Spanish speaking voters care about. You may remember some errors made when addressing Spanish speaking voters by Mitt Romney in 2008. On every notable issue was his use of a Castro quote to a Cuban-American audience. This was certainly not the right audience and as you can imagine, the speech did not end on a particularly high note for Romney. He also infamously told a Cuban-American TV presenter that papaya was one of his favourite fruits. In Cuba papaya is a slang term with sexual connotations, so for numerous viewers, Romney’s claim was incredibly inappropriate – and hilarious. The key to translating your political message is to know your audience well enough to be able to deliver the message in a way that is relatable. Localisation is important to all successful translation and localisation relies heavily on knowing your market and audience. Politicians who do not have a grasp of the Spanish language need a very strong translation team on their side in order to truly send their campaign message to Hispanic voters. 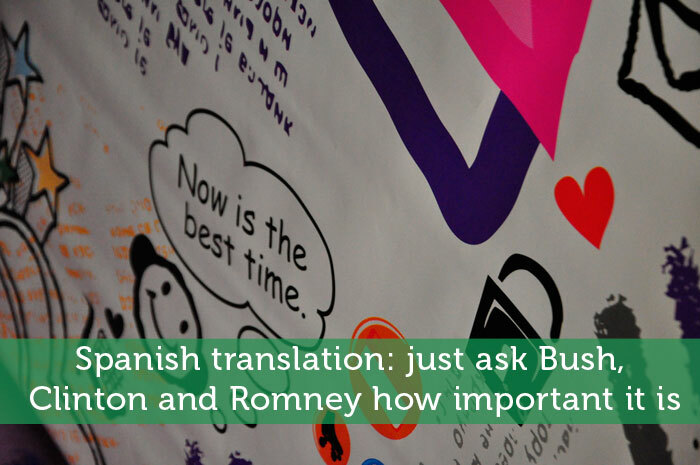 Small mistakes can make all the difference in a presidential campaign, which could be incredibly useful to Jeb Bush as a fluent Spanish speaker. We’ll have to wait and see if the other candidates can capture the favour of Spanish-speaking America through strong policies and attention to detail in their speeches. This is the reason why multilingual is an advantage because they can relate to wider audience with different language needs. Personally, if I were to learn a new language aside from English and French, I’d definitely go for Spanish.